Giving our Daughters the Tools to Reach for the Stars…and Showing them How to Really Chase their Dreams! With all the mounting possibilities and opportunities for women, what a wonderful time it is to be a young girl growing up! As mothers and fathers, we'll want to nurture our girls with love and encouragement, give them our time, and make them always feel supported and safe. Lead the way by being their role model! Be transparent—let them see your strengths and even a few of your weaknesses. They'll most likely learn to follow your example at a young age, so make sure your setting a good one! In honor of International Women's Day, we'd like to share a few tips to help your daughters grow up with positive self-esteem and a strong sense of self-worth. So they can, one day, go on to accomplish their biggest goals and make their dreams a reality. 1. Allow her to be curious and persistent—to voice her opinion, knowing that you're listening. In fact, require that she does! Demonstrate to her what it means to be true to herself: strong in her stance and confident in her own skin. 2. Urge her to dream big, play dress up, and be imaginative. Remind her that she can be anything she wants when she grows up: a dentist, a teacher, a scientist, a doctor, an author. Don't sugarcoat any of the work it takes to become one of these figures, of course. You'll still communicate to her that it takes hard work, but explain that this is what makes the experience so rewarding. 3. As she enters school, make sure she is forming meaningful relationships with female figures in school or outside of school. It's important for young women to have mentors outside of their home, too. 4. Help your daughter focus on who she is—defined by her heart, character, abilities, self-worth, those who love her—rather than her physical appearance. 5. Show your daughter how to set and track achievable short term and long term goals. You can show her how to start small and stay grounded in what she chooses to write down, but also make sure she doesn't limit herself. However, it is important that the goals are realistic to her abilities. Be sure to revisit these goals together as often as possible! Your daughter's self-esteem and development is the most malleable and impressionable in the first three years of her life. Use this stage of her life to really teach her how to value herself, her thoughts, her mind, her heart. Don't be hard on yourself though! Remember that some girls develop a sense of independence with more ease than others, and this is not a reflection on your parenting. It's never too late to start teaching your daughter self-worth, whether she's two or fifteen. Every girl needs guidance, YOUR help with discovering her talents and abilities, and your support in the careers, goals, dreams, etc. she chooses to pursue. With your time, patience, and guidance, she will grow up to be an amazing woman! We encourage you to share scientist Marie Curie's story with your little girl today to inspire her to plan a big future and chase after her dreams! 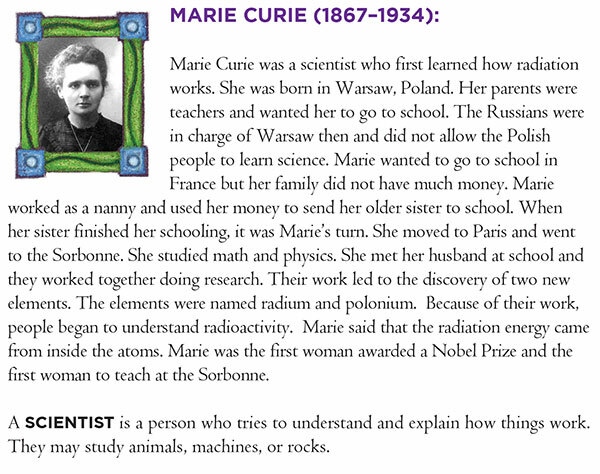 Marie Curie was the first to learn how radiation works and the first woman to win the Nobel Prize. This blurb can be found, along with other amazing women who have changed history, in Jennifer Fosberry's personalized book My Name Is Not Isabella. Show your daughters how to dream big with the two personalized books below! My Name is Not Isabella takes your child on a journey through time to learn about some of the amazing women who changed history. Your daughter will go on an adventure of discovery—and find out how imagining to be these extraordinary women can teach her the importance of being her extraordinary self. Turn Kristi Yamaguchi's New York Times bestselling picture book into a personalized hardcover keepsake that your child will always cherish! This customized book will make your story time an extraordinary experience you will both remember forever.